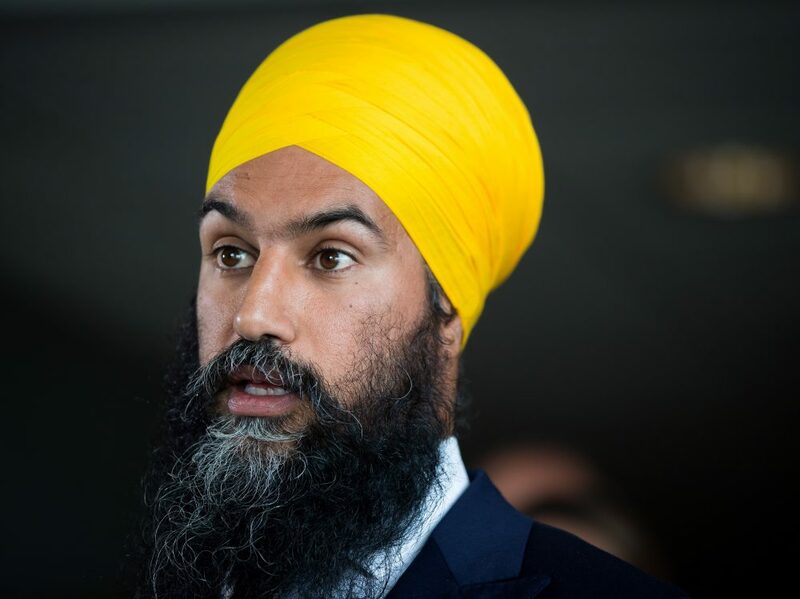 A great deal of recent punditry is creating an expectation that Jagmeet Singh will lose the Burnaby South by-election, forcing him to resign as leader, creating a dilemma for the NDP as the 2019 election looms. Having looked at the politics and precedents, my view is that he is actually more likely than not to win Burnaby South. First it needs to be said that overall the NDP is not all that badly off. It is clear now that it was a mistake for the party to oust Thomas Mulcair, but to suggest this means the NDP is about to be permanently decimated is unjustifiably melodramatic. The state of the NDP was addressed by UBC political scientist Richard Johnston who holds the Canada Research Chair in Public Opinion, Elections, and Representation. One of the best analysts of public opinion in Canada, he recently wrote a post on his website titled: Is the NDP tanking? That the NDP is tanking seems to be something of a media commonplace. The image is often invoked as part of the coverage of Jagmeet Singh’s pending contestation of the Burnaby South by-election. He is damned for not running for a seat–somewhere, anywhere–before now. (Where he might have run is not obvious, a neglected fact.) Justin Trudeau’s delay in calling the by-election and the suspicious timing of the potential opening on Singh’s home turf feeds the sad sack narrative. Coming back to the present, recent polls do suggest a modest drop, and the trend may continue. ... The nation-wide pattern may disguise special weakness in Quebec. There is no doubt that the NDP is weak in Quebec, due in part to dumping Mulcair. The NDP is currently down about 11 percentage points from the 25.4% it won in Quebec in 2015. However, this is not the case in British Columbia, which is what matters for the by-election. The average of recent polling numbers suggest the party might actually be slightly stronger than in 2015. Polling data is noisy in BC so it is difficult to say for sure. Many reports cite the closeness of the result in Burnaby-South in 2015 when NDP candidate Kennedy Stewart defeated the Liberal candidate by just one percent. But any given election outcome is contingent on its context, not carved in stone. 2015 was very good election for the Liberals. In Burnaby South the Liberals gained over 20 points from its showing in the same area in 2011 (this is an estimate done by http://www.election-atlas.ca as the boundaries changed). There were elements of a wave election in 2015, and it well may be that the Liberals picked up support in 2015 from voters who previously supported parties such as the NDP and the Greens. The Green vote will matter a great deal in this by-election as the Greens are not running a candidate to permit the NDP leader to gain entrance to Parliament. An environmental issue that could easily affect the race is the Trans Mountain Pipeline whose terminus lies a few kilometres north of the riding. The Green Party has decided in the case of this by-election to extend "leaders' courtesy" by not running a candidate, in effect, endorsing Singh, who will be the only major candidate opposed to the pipeline. If opposition to the pipeline actually proves to be weak here as a vote motivator, it suggests smooth sailing ahead for Trans Mountain. Leader's courtesy no doubt played a role in the initial election of Elizabeth May in 2011 in Saanich-Gulf Islands. The Green vote there jumped from 10.5% in 2008 to 46.3% in 2011. The phenomenon of 'leader's courtesy' can also be detected in much older election results. One striking example was the victory of John Turner in Vancouver Quadra in 1984 general election. Not only did the Liberals lose in a landslide to Brian Mulroney but the party won just forty seats overall. However, despite losing all those seats in this case a constituency that had voted four times in a row for the PCs saw its incumbent defeated by Mr. Turner. A second example is provided by Calgary Centre in the 2000 election when Joe Clark, in his second stint as PC leader, won a seat that had voted Reform twice in a row despite the fact that overall PC fortunes declined by a third from 1997 TO 2000. Yet another example was provided in provincial politics in Manitoba in 1972 when Liberal leader I.H. Asper won a by-election in Wolseley constituency, a riding that had been represented since its creation in 1958 by Progressive Conservatives including former Premier Duff Roblin. The Liberals at the time were a weak third party in the legislature. Will Jagmeet Singh win Burnaby South on February 25th? In politics you never know but most facts about this by-election suggest the answer is yes. A more likely NDP loss would be Thomas Mulcair's constituency of Outremont. As noted Liberal support is up in Quebec; the NDP significantly down, and of course leader's courtesy will not apply. However, even there look for the NDP to win polls in the eastern end of the riding, an area that recently voted for the left wing provincial party Québec solidaire in the October 2018 provincial election. Since I posted this item on January 13 there have been two important developments. A poll was released by Mainstreet Research on January 15 reporting a large lead for NDP candidate Jagmeet Singh, placing him over 12 points ahead of his nearest rival, Liberal candidate Karen Wang. The Liberal candidate running against NDP leader Jagmeet Singh in the Burnaby South byelection has resigned following a Star Vancouver report on her post on the Chinese social media app WeChat that urged people to vote for her, the “only Chinese candidate,” and not “Singh of Indian descent. The Liberals still have a couple of weeks to find a new candidate but this type of incident contradicts their message and values and can only be harmful. Both developments reinforce my conclusion that the answer to question posed in the title is yes. The first thing that needs to be said about this is BC may well vote to change its electoral system. Much of the polling to date has been favourable to electoral reform although the margin has been tightening and the most recent survey has those favouring the existing first-past-the-post system ahead by one point 50.5% to 49.5% - effectively a tie. The question on the ballot is in two parts. The second part asks the electorate to choose among three options. When I looked at the choices it struck me that of three there is only one realistic choice and that is Option Two. Here is my analysis of the three options. Option One is called dual member proportion, explained by Elections BC here. One key aspect of the proposal that is also its greatest weakness is that parties would normally be expected to nominate a primary candidate and a secondary candidate in a series of two member districts. Without going into the details the result is proportional (indeed I find the design rather ingenious), but we have a political culture that would not at all understand the idea of primary and secondary candidates. The system is new and is not in use anywhere, so it is highly likely to have some unforeseen consequences. "The conventional wisdom concerning the choice between majoritarian electoral systems and proportional representation (PR) – and, more broadly, between majoritarian and consensus forms of democracy – is that there is a trade-off: PR and consensus democracy provide more accurate representation and better minority representation, but majoritarianism provides more effective government. A comparative analysis of 18 older and well-established democracies, most of which are European democracies, shows that PR and consensus democracy indeed give superior political representation, but that majoritarian systems do not perform better in maintaining public order and managing the economy, and hence that the over-all performance of consensus democracy is superior." A recent poll by Mainstreet Research reports that this is the preferred option in BC. Option Three, which Elections BC labels as Rural-Urban Proportional actually would deploy two systems, the Single Transferable Vote in multi-member urban districts, while Mixed Member Proportional as described above would be used in rural areas. This makes little sense to me and it baffles me to see it as an option. The Single Transferable Vote requires voters to rank their choices, 1, 2, 3 etc. It then requires a complex, indeed an opaque system for counting the votes. It has been used in the past in a number of Canadian jurisdictions but no longer. In my view it is not strictly proportional (political scientist Rein Taagepera has demonstrated how it can actually produce a non-proportional outcome) but more often than not, and certainly more than FPTP, it generally does produce proportional outcomes. Apart from the complexity a new system will be seen as more legitimate if it is the same everywhere, a virtue that characterizes the first two options. However, it was recommended by a Citizen's Assembly in BC in 2005 and supported by a majority in a subsequent referendum but failed as the government of the day required a super-majority of 60% and the YES vote obtained was 57.7%, so it fell just short. This would explain its presence on the ballot here, although I think it would make more sense as a province-wide choice. If one views this period of Canadian history as a whole one can see numerous attempts at fundamental electoral system reform. Even if this one fails it appears increasingly likely we will see successful electoral reform in the near future. In Quebec the newly elected Coalition Avenir Québec government has promised a new electoral system by the time of the next election without a referendum. Proportional representation - Arguments in favour based on the results of the 1993 election. This is an essay I wrote in 1997 titled Ten Arguments for Proportional Representation. I used the 1993 federal election as a starting point. Some of the discussion is clearly dated but the extent of vote distortion in 1993 makes it an ideal candidate for analysis of this kind. The tables above illustrate the difference between the results of the 1993 federal election and what the House of Commons might have looked like had it been elected by proportional representation. 1. The most compelling argument is that Proportional Representation (PR) more faithfully adheres to the democratic ideal. Unlike our current first past the post majoritarian system, PR would elect a House of Commons which accurately reflects the real preferences of voters. Each party’s share of House of Commons seats would roughly approximate their share of votes. As the size of a party’s contingent of MP’s depends on its total vote, each voter can take comfort in the knowledge that their ballot contributed in some measure to that result. Currently many voters see their votes “wasted” on individual candidates who simply lose. In a PR election, in a very real sense, every vote counts. The sole exception is votes cast for parties who fail to achieve a minimum threshold. Such minimum levels of support (5%, for example) are common in countries with PR. As a consequence of a greater sense of efficacy on the part of individual voters, countries with PR have on average higher voter turnouts - about 10 percentage points more. 2. PR always produces a more balanced outcome. What astonished many about the 1993 election were the extraordinarily lopsided results - 98 of 99 seats in Ontario going to the Liberals being the example that springs first to mind. In fact, the outcome was lopsided in most provinces and Liberals weren’t the only beneficiaries. Reform won 75% of the seats in B.C. with 36% of the vote while the Bloc won 72% of the ridings in Quebec with 49% of the vote. Even the NDP managed to win 36% of the seats in Saskatchewan with just 27% of the votes. Only the Tories lost out everywhere (having benefited from the system in 1988). The 1993 election was probably somewhat extreme in the lack of symmetry between the distribution of votes and constituencies won but such outcomes are characteristic of our current electoral system, and by definition impossible under PR. 3. The Bloc would have been denied its status as official opposition. The tradition of the parliamentary system is that the party with the second largest number of seats becomes the official opposition. That it should fall to the BQ after 1993 seemed both inappropriate and bizarre. The Bloc was a purely regional party whose raison d’être was to exit the institution to which it had just been elected following what it expected to be a YES vote in a Quebec referendum. If PR had been in place not only would Reform have assumed its rightful place as official opposition but there would have been another equally important outcome in Quebec itself. Under PR the Bloc would have been entitled to 38 MP’s, only half of Quebec’s ridings - a more realistic reflection of Quebec opinion. The Liberal party did elect some francophone federalist MP’s but many were elected in ridings with large English speaking or multi-ethnic populations. Under PR francophone federalists would occupy a number of seats commensurate with their real numbers in Quebec society - around 40 per cent. Note that some would likely have been among the 11 Tory MP’s that would have been elected in Quebec. 4. The Progressive Conservatives and the NDP would have retained party status and held on to a significant number of seats in the House of Commons. The PC’s and the NDP between them commanded the support of over 3 million Canadians in 1993 but won a total of just 10 seats. Immediately following the 1993 election the media all but ignored both parties because reporters naturally equated House of Commons representation with the real preferences of Canadians. Under PR they would have continued to enjoy the status in Canada’s political scene to which their millions of voters were entitled. 5. The real political diversity of Canada that exists within the various regions would be reflected in political representation in Ottawa. Regional tensions are exacerbated when the first past the post system systematically elects full slates of one party. For example, under PR Reform would have had more members from Ontario than Alberta or B.C., and even two MP’s from Atlantic Canada. The Conservatives, all but shut out in 1993, would have had representation from every province. The House of Commons would lose its appearance of being divided between a Liberal party with a largely Ontario face, a western Reform party and a Bloc Quebecois apparently representing most of francophone Quebec. 6. PR would encourage the formation of new parties and groupings that represent real social trends in Canada and help them get into Parliament. If European experience is any indicator, it is likely that the environmentalist Green party would win seats at least in B.C. if not elsewhere. Many Canadians experience a sense of alienation from the political system that is caused in part because the electoral system rewards older well-established political parties and punishes upstarts. The only exceptions historically have been regionally rooted parties such as the Bloc and Reform. 7. PR allows for a clearer expression of real ideological differences among Canadians. The Winds of Change Conference held in Calgary in 1996 represented a major effort to bridge the differences between the Progressive Conservatives and the Reform Party. It collapsed partly because both sides have an interest, in the context of the current system, in driving the other out of business. As well, despite their similarities, there are genuine differences between the two parties. For example, Reform and the PC’s have radically different approaches to national unity. Under PR they would have the opportunity to coalesce around issues, and perhaps someday to form a government, while retaining the integrity of their philosophical outlooks. It was dissatisfaction on the part of some small ‘c’ conservatives with the Mulroney government which led to the creation of the Reform party. Under PR, this diversity among conservatives could be reflected openly in political discourse. Under the current system, the alternative to perpetual opposition appears to be that the two parties will be forced to amalgamate. [Note: as it turned out coalition of the two parties occurred via what amounted to a takeover of the PCs by Reform with the new party adopting the name Conservative.] But this is likely to lead to an ongoing war between right and left for the surviving party’s soul. Under PR both could continue to reflect the divergent views that led to the current situation in the first place. 8. PR would diminish the opportunities for arrogant or capricious governance. Our majoritarian government vests too much power in the leader of the party which wins a majority in an election. The Prime Minister has the power to hire and fire and cabinet ministers (and even to appoint candidates in local constituencies). The greatest difference that PR would have made in 1993 is that the Liberals would not have formed a majority government. In fact, majority governments would become rare under PR. This inevitably forces inter-party bargaining and compromise and power becomes more diffuse. No single individual can dominate. 9. PR systems better represent minorities and other under-represented groups such as women. Political Scientist Arend Lijphart found that PR parliaments have about four times as many women as non-PR legislatures. PR could provide better representation of the different strands of an increasingly diverse Canadian society and so help ease social tensions. 10. Last on this list of arguments but of enormous importance in a country with a history of constitutional paralysis: the political system can be reformed and improved by Parliament acting alone. After trying out proportional representation and finding it not to their liking, Canadians can, if they so desire, restore our old way of doing things. Unlike constitutional change, legislated institutional change can be used to experiment with a better way of doing things. In my next post I will discuss the options facing citizens of BC in their current proportional representation referendum. If entirely conventional benchmarks were what mattered in the U.S. elections on November 6 the current strength of the economy - essentially the pinnacle of the growth cycle that started with Barack Obama's stimulus bill in 2009 - then the Republicans ought to be doing extremely well. In 1998 in the midst of another period of strong economic growth - the roaring nineties as Joseph Stiglitz dubbed them - the Democrats made gains in the House of Representatives despite the impeachment proceedings against Bill Clinton. This happened although off year elections following a presidential re-election are generally likely to damage the incumbent party. Credit may be due Obama for today's economic circumstances, but it is the current incumbent who gets credit or blame for the economy in U.S. politics. However, Trump has managed to alienate large swathes of the U.S. as he essentially doubles down on the extreme white racism and misogyny that has been hallmark of his administration. It is a source of strength in rural and small town America but a source of weakness in the parts of the U.S. that are urban and diverse. My overall impression is that this racial/ misogynistic extremism will lead to large Republican losses in urban and suburban areas, while Republicans will be either as strong as before or stronger in more rural communities. We saw this a year ago in the statewide election in Virginia where the Democrats won the Governorship by an unexpectedly large margin - the polls were wrong then, underestimating the Democrat margin. The Democrats made huge gains in the state legislature almost gaining control. However, when I looked closely at the results I saw that the Republicans had held their own in rural areas. This year the Republicans may well gain a few rural seats in the House of Representatives at the Democrats expense, but that will be more than offset by gains in suburban areas. In the Senate just one third of the institution is being elected, and strong rural support for Trump in places like North Dakota may keep the Senate under Republican control. We won't know what will happen until after the polls close. The most interesting and significant Senate race is the one in Texas where the highly successful run by Democrat Beto O'Rourke may fall short in its effort to oust the execrable Republican Ted Cruz. However, it matters in the long term. That is because Texas is already similar to California in having a population composed of a majority of minorities. According to 2016 population estimates 44% of the Texas population is white. Republican control of its politics rests on lower turnout among the 37% of the population that is Hispanic. Population trends in California, now a reliably blue state, preceded Texas. In California the white population is 39%, while black, Asian and Hispanic populations total 59% of the population. Texas is headed this way and a key political indicator was the shift in support for the Democratic presidential candidate Hillary Clinton - she shrunk the size of the Democratic loss from 16% for Obama in 2012 to 9% in 2016. O'Rourke has raised a lot of money and is spending on turning out Latinos. There are similar population trends in Arizona and Nevada, two states that may switch from Republican to Democratic Senators this year. Trump's racism and misogyny is the very opposite of what would serve Republicans in the long-term. According to Pew research there is a large gender gap in party identification with younger women supporting the Democrats by a huge margin. The racial and ethnic shifts in the composition of the American population along with large shifts in party identification and ideology, particularly among younger women, will register in Tuesday's results but the greatest impact of these trends will be felt in the years to come. Will Doug Ford become a one term Premier? Normally it would be absurd to pose such a question so early in a new government's term. However, if Doug Ford thought the electorate would submit meekly to his authoritarian ways he must know better than that now. Nonetheless he doesn't have to face the electors for four years. He keeps talking about his mandate. He conceives of the legitimacy of government in traditional first past the post terms. If you won the most seats regardless of how votes were distributed the voters must like you and the public should defer to any oddball scheme you propose, like disrupting Toronto's civic election to cut the number of councillors on the grounds that there is real money to be saved, and that the existing council is dysfunctional. On the latter score Toronto Star columnist Edward Keenan columnist had it right when he wrote recently, "Whatever obvious dysfunction and gridlock Doug Ford witnessed in his years on Toronto council, he and his brother were the cause of it." ... let’s look for a moment at the talking point often used by Ford and his caucus and defenders: that Toronto city council (somehow because of its size) has been unable to build any transit in the city. Leave aside a moment that the proposed remedy makes no sense. The premise, itself, is wrong. Toronto built lots of transit until the Conservative government of Mike Harris in the 1990s cancelled subway lines that were already under construction (even filling in a tunnel on Eglinton) and simultaneously withdrew all provincial funding for Toronto transit. Fast forward to the mayoralty of David Miller, when the city council approved, got funding for, and began building the subway extension to York University and Vaughan (which is now open) and the Eglinton Crosstown subway/LRT line (which is still under construction and should open in a few years). He also had approval and funding to build the Sheppard LRT and the Finch LRT and a replacement for the Scarborough RT, all of which would already be open right now …. The premier’s late brother Rob Ford was elected mayor and declared those projects dead. They proposed a ridiculous transit plan, instead. The city council they were supposed to lead overruled them. A new plan — a Bloor-Danforth subway extension in Scarborough and some LRT lines — was approved. Since the Ford brothers left, a bunch of transit projects have been approved in principle or affirmed (including a subway extension and a new subway line), some of them at least partly funded, and work has progressed on them. The other justification is that cutting council seats will cut costs. As I pointed out in my last post the assertions about cost cutting are completely misleading. The savings are trivially small - about the cost of one Tim Horton's extra large coffee per year for each citizen of Toronto. Our political culture until recently has accepted without question the idea that the party that finishes first is legitimate and has a mandate to govern, but that has been eroding. There is increased pressure for proportional representation - the simple idea that representation in the legislature should closely reflect the partisan distribution of actual voting. In fact, there is yet another referendum underway on this subject in B.C., that province's third in the last 13 years on the issue of proportional representation. Officially, the Ford PCs captured 40.5% of Ontario's vote in the June 7 election, meaning other parties garnered on overwhelming majority 59.5% of the vote. However, looked at another way the Ontario election's 58% turnout meant that only 23.5% of the electorate as a whole voted for Ford. This kind of data point didn't matter in the past but seems likely to matter more and more in the future. One unusual aspect of this election is that Ford was unpopular when he came into office. On election day Andrea Horwath had a higher approval rating than Ford. Usually the most popular party and leader dovetail, not this time. Not only does Ford start out behind on the approve/disapprove scale but in the City of Toronto, although tied with the NDP with 11 constituencies won (the Liberals took 3), the Ford PCs received a lower proportion of the vote overall, trailing the NDP by almost four points. Moreover their 32.8% support was a smaller percentage than the 33.7% support Ford won in the 2014 municipal election. Small wonder his midnight madness is not being received well in the city. The polling firm found that 65 per cent of Toronto residents oppose the premier’s move to use the constitutional override clause, with nearly 56 per cent saying they strongly disapprove. “Make no mistake about it: Doug Ford is on the wrong side of public opinion when it comes to his use of the notwithstanding clause,” Quito Maggi, President and CEO of Mainstreet Research, said in a news release. Further to the controversial use of the clause, more than 55 per cent of respondents said they disapprove of the decision to eliminate council seats, with 46 per cent saying they strongly disagree. Ultimately, Ford will be judged not on this but on his overall spending and taxing regime. However, he will encounter major problems along the way including the fact that Ontario is already one of the lowest spending jurisdictions in Canada. He has promised a line-by-line spending review, no doubt hoping to find spending that is the equivalent of paying people to dig ditches and then fill them in. However, he is also no doubt forgetting that we have been through this before. Dalton McGuinty hired TD Bank economist Don Drummond to do essentially the same thing in 2011. As the Toronto Star report on the published review noted "quick fixes and easy savings are notably absent here". Ford wants to cut taxes but he will encounter a similar problem in this field. Ontario taxes are already relatively low. It is an imperfect measure but the tables below does give you some idea of Ontario's position. Ontario has among the lowest tax revenues among Canadian provinces relative to the size of its economy. There are many who incorrectly perceive Ontario as a high spending, high tax province. The numbers say otherwise. Ontario is consistently eighth or ninth on this score. It is not surprising that former PC leader Patrick Brown supported a carbon tax despite its unpopularity among rank and file Conservatives. He understood that Ontario needed the revenue, something Ford hasn't figured out yet. He is in court arguing the federal government does not have jurisdiction to levy a carbon tax, an effort doomed to failure. Ford's weakness in the polls was already evident earlier this year. The PCs did better in the polls on average before the election call than after. The reality is that for the Ontario PCs Ford is a liability and not an asset. If one examines both the vote overall and among Ontario regions we find that the Ontario NDP gained more support in 2018 in most regions compared to 2014 than did the Conservatives. There were two exceptions - 905 North, the affluent suburbs north of Toronto, and Northern Ontario, where the NDP was already strong in 2014. Had the PCs stuck with Patrick Brown or selected Christine Elliott winning additional terms would seem likely at this point, not so with Doug Ford. Already journalist Stephen Maher is speculating in Maclean's that Ford may be leading a one term government. One can only hope his career arc follows that of Alison Redford, whose caucus forced her out as Alberta Premier two years after her PCs won a majority election victory. The Ford government lost for a second time in the courts on one of its early and arbitrary initiatives - the downsizing of Toronto City Council. Ontario Superior Court Justice Edward P. Belobaba ruled on September 10 that the Ford government's legislation violated the Charter of Rights. profoundly unfair. The question for the court, however, is not whether Bill 5 is unfair. The question is whether the enactment of Bill 5 is unconstitutional. crossed the line that the “judicial umpire” should intervene. The Province has clearly crossed the line. In addition to timing the judge also found that cancelling the new 47 ward system violated the Charter by undermining the right to "meaningful and effective representation". Regardless, the Ford government's justifications for its actions were seriously deficient. In the news release from the premier on July 27 he claimed that the bill reducing the size of council is "estimated to save Toronto taxpayers more than $25.5 million over four years". Sounds like a lot of money right, millions of dollars. This sort of misleading use of numbers happens all the time so let's examine more closely what is at issue here. First note the over four years qualification. Lets do a little math. Every year as a homeowner in the City of Toronto I pay thousands of dollars in municipal property taxes every year so you would think significant savings should be welcome. $25 million dollars divided by 4 gives us 6.4 million dollars per year. However, there are 2.9 million citizens in the City of Toronto so the saving for each one of us is only $2.20, about enough to buy an extra large coffee at Tim Horton's once a year. In other words the savings Ford claims are utterly trivial, especially weighed against the steep cost to local democracy. There is something we can do. The key democratic items in the City of Toronto Act, those relating to the number of wards and elections could be added to the Constitution Act, 1867 by an amendment made under section 43 of the Constitution Act, 1982, which permits the constitution to be amended with the support of the legislature of the province and the federal House of Commons and Senate. Of course the protections could be removed in the same way, but it at least slows down the process. In the past the federal government has enacted amendments only where substantial support for the measure has been demonstrated within the province. In this case, substantial consent should be demonstrated within the city for such a change. In fact, the City Council voted to oppose the change and a recent poll found a clear majority of those making a choice were opposed. As the recent controversy has illustrated the Ford government is prone to act impulsively and arbitrarily. Municipal institutions are entirely with provincial jurisdiction but enacting the amendment suggested above would at least grant a small degree of constitutional protection to the citizenry as voters in municipal elections. Hopefully it would become a symbol no government would mess with. The court decision today was welcome, but it could have gone the other way. It will take at least four years to get a provincial government sympathetic to the idea of enacting constitutional protection for municipal democracy, but building support for the idea should begin now. Ford reacted by saying he will overturn the decision using the notwithstanding clause. This is utterly capricious. The notwithstanding clause is a blunt instrument and should only be reserved for extreme cases. It seems to me this strengthens the case for a constitutional amendment such as the one described above. The Ford government clearly needs restraint.